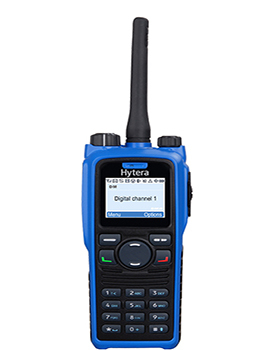 The HYTERA PD792i Ex is a full sized 4.9” tall Analog and DMR Digital two way radio with blue case, certified for the latest North American FM and Canadian CSA standards as well as European ATEX, CQST IIC and IECEX. With 1024 channels, Emergency mode, voice annunciation with special technology for superior and crisp audio in noisy environments (AMBE++ or SELP), a 1.8” LCD color display and full keypad, this user friendly two way radio makes migration from Analog to Digital a simple process. Each channel can be programmed to either Analog or Digital mode allowing for both forms of communication to be used on one radio. The PD792i Ex’s Wide frequency range allows FEDERAL and Commercial frequencies to be programmed. Covering the UHF 400-470Mhz and the VHF 136-174Mhz bands with 1 Watt, the PD792i Ex can be used in direct or repeater mode. The PD792i Ex includes value added digital features such as Vibrate Mode, One Touch Call, multiple Digital voice calls, including Pseudo trunk (HYTERA EXCLUSIVE FEATURE) which enhances the channel capacity. Basic encryption is available in Digital mode, with higher encryption standards, AES and ARCFOUR (ARC4), available as value added options. The PD792i Ex also has optional Digital features such as GPS, MAN DOWN, Decode Radio Enable, Radio Disable, Remote Monitor, Site Roaming and Priority interrupt. The PD792i Ex display allows for private, One touch Call and Group text messages to be sent from a canned message list or FREE STYLE TEXT messages can be created. Featured buttons allow individuals from a member list to be identified to generate private calls improving communications and reducing radio noise by keeping group calls to a minimum. The PD792i Ex Analog features include Multiple advanced signaling modes such as CTCSS/CDCSS, HDC1200 (resembling MDC1200), 2-Tone,5-Tone and Scrambler for increased privacy. The PD792i Ex includes an expansion port that allows third party developers to integrate specialty applications such as voice recording and dispatch terminal integration. With a standard 1800Mah Lion capacity battery, a patented battery latch and based on the 5-5-90 standard, the radio can provide up to 17 hours of Digital communications. Meeting the IP67 standard (INGRESS IN WATER UP TO 1 METER FOR 30 MINUTES) and MIL-STD 810 C/D/E/F/G testing for Humidity as well as shock &vibration, the PD792i Ex is designed to be rugged, not just compact. Silicone Encapsulation of all internal components stops the intrusion of liquid, dust and harmful gas. This silicone process is so time consuming that each PD792i Ex radio requires 8 hours of manufacturing time. The PD792i Ex’s size, features and ruggedness offers Oil & Gas refineries and Firefighters a fully featured two way radio that can provide years of service in those demanding environments. The PD792i Ex is covered by a standard 3 year Manufacturer’s warranty which can be increased to 5 years with the optional 2 year extension.